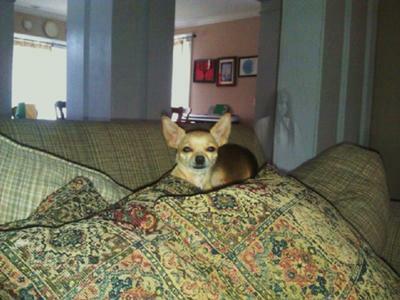 Was just sitting on the couch and took an impromptu shot of my Chihuahua on my Droid Incredble 2. One of many I have taken in the past. It's been about a month, and as I was looking back, low and behold, I found this shocking pic that still has me scared. I live in North Georgia which saw heavy battle during the civil war. This could be a manifestation of that. Just spooky. Promise, no props, projections, nothing. This image is a fake. - its been photoshopped. if you have a look at the pictures on the following websites you'll see it is the exact same girl just faded out more. She isn't an Indian girl. I think she is a Japanese or a Korean girl. i am a believer - i see these things almost every day so this comment is not a matter of belief - its a matter of frustration as these fake images make it harder for people to believe the TRUE ones!! My son has a nabi tablet, but this chick is way more clear and in a diff position ever so slightly. My son was alone taking a pic of himself. Not sure how it go there but i have saw this on the droidforrum.com very crept. But if u know where this is from, app wise please tell me. I just want answers. Thanks all! Same "ghost" same "pose". It's an app, folks. I too found this image on my Android phone pictures. I think someone at Samsung has been pulling a fast one. Same girl, same pose, same cut-off point on the bottom of the picture.I'm reporting it to Samsung, you might do the same. We've been had!